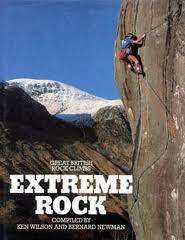 Extreme Rock provides possibly the greatest tick-list for the unimaginative climbing geek. It represents an unrealistic challenge for all but the very best, featuring as it does routes between E1 (ok) and E9 (less ok…). However, out of reach though it might be what it does do is provide the necessary impetus and drive to visit a number of places that you never would have. By and large the routes are of the highest quality, you just have to make sure that you don’t put the blinkers on and ignore all the other good routes surrounding those in the book!